I've been wearing many hats this week. 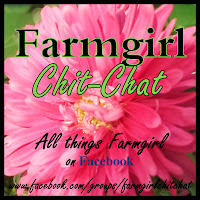 I am sorry to say that I haven't yet had a chance to visit every link up for Farmgirl Friday, but I will before too much longer. I had a little accident in my beloved veggie garden and broke two toes. I have been slow, hobbling along like a hobbit ever since, but here's a peek at what I was doing... I'll be posting about it for the Country Garden Showcase on Monday. Think OMRI. On a happy note, today was the monthly meeting for my Thimbleberries Club which is held at one of my favorite quilt stores, Debbie's Fabrics. I burned the midnight oil last night. I procrastinated right up to the end on my January assignment, but I somehow managed to get it done and fall into bed at 5:30am. Shame on me. I will pinch myself if this happens again. I got bit by the sunshine bug and I've been outside when I should be quilting. We are each being asked to make 15- 3 1/2 x 6 1/2 inch flying geese blocks for every meeting, put them into a sandwich bag, write our name on the bag and deliver them to club for a special surprise in September... A mystery quilt that we will then make in September. I am really excited about this challenge. I love mystery quilts. They're so much fun. Another fun challenge that we are doing every month is the Tea Towel Challenge. For this challenge we simply decorate a pretty tea towel with an applique image selected by Lynette Jensen, the creator of Thimbleberries. January's applique design was a snowflake. February's design is a heart. This pretty winter green plaid tea towel was made by Gail. I bought a few more tea towels to play with. 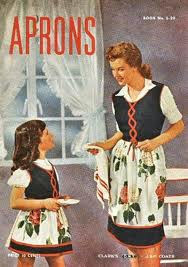 I am thinking about making a durable tea towel half apron. I am apron addicted lately. They're so much fun to make I have really appreciated how they protect my clothes from baking and cooking trauma. Maybe I will make something similar to this image above that I found online. That's just too cute! Debbie gave us a great little demonstration of a helpful flying geese making tool made by Eleanor Burns of Quilt in a Day. I like her tools, books, and time saving projects. Considering that I will be making more than 200 flying geese to complete this year's club projects and challenges, I got one of those little tools. I'll be sure to share a review of this product once I've gotten the hang of using it. Each meeting, Debbie makes us yummy treats like these homemade chocolate cherry cupcakes and the sweetheart punch. Both recipes are in the TB club book so we can make them too. Yippee! If you look close on the back wall, you may see the completed 1st quarter project. Today, we were supposed to have completed Part 1 of 3... that's what my little quilt should look like when I am done. I really like it. It's hearts and flowers. It's a mad house when club ends. At that point, it's a race through the shop to find the goodies you want because Debbie discounts all Thimbleberries products by 20% for us and she always offers some deep sale of the day. It's a fight to the register. I get nervous in crowds so I usually stand back and take in all the new quilts Debbie has featured along the walls. Here are a sampling of the things that stood out to me today... my favorite kind of eye candy, fabric. Here are a few of the MANY bolts of fabric in the shop. I love this shop. She really crams alot of neat fabric and tools in there... Well, that's what I did at club this morning. Right now, I am going to go elevate my chubby little toes for a bit. You broke toes! Ouch! On another note, the quilt photos are beautiful! Heidi I love the name "Thimbleberries Club" how clever........I love all your pictures of the beautiful fabrics they are just so rich! 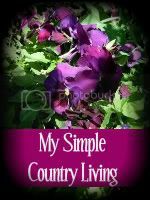 So sorry you broke two toes that is just awful....hope you feel better soon......sending hugs from North Carolina and thanks as always for linking up to "The Ole' Saturday Homesteading Trading Post". I will be linking up to your hop tomorrow! I'm sorry you broke your toes. I hope you heal quickly. Thank Kathy. I love your latest quilt block. Y seams scare me off. Thanks for the North Carolina hugs. 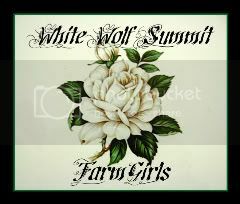 I love your Ole' Saturday Homesteading Trading Post party and I look forward to seeing what you've been up to in your garden this week... Hugs from California right back. Sorry to hear you broke your toes. Is Sugar Plum nursing you? Tell Jerry to baby you.We all need to be treated special when we are sick or hurt. Oh my goodness! I can't believe you broke two toes. So sorry and hope you heal quickly! I have to say, I think we are two peas in a pod...pulling all nighters, being lured outside by the sunshine...when the bug bites, what else are you supposed to do ?? Oh my goodness two toes sorry I did not know that. I hope they mend quickly. Love all of the fabrics..great post. Thanks Michelle for stopping by. Have a good night. I'm taking it easy. Thanks Sharon. Two peas in a pod indeed. Have a GREAT week. Thanks Dolly. I'm taking it easy. have a GREAT week. I broke two toes two weeks before my wedding and hobbled up the aisle, I know it's not fun. Hi, I found you through the Barn Hop! I am a newbies quilter and love your quilting projects. Thanks for sharing.